On Wednesday Bioware revealed a new KotFE trailer at Gamescom, this one consisting mostly of in-game cut scenes. Considering their poor track record with trailers like that, this one was pretty good. More than anything however, it provided me with a lot of food for thought about the upcoming coffee expansion. First off, I wasn't aware that Darth Marr had such a huge fanbase. I didn't even notice him standing off to the side when I first watched the trailer. But the YouTube comment section for the video is filled with exclamations like "Marr is alive! ", "So glad to see this, I would have unsubbed if they had killed Marr off", or: "Can I have him as a companion please?" I mean, I like Darth Marr as much as the next person, but I was still surprised to see such an outpouring of love for him. Personally I was more focused on Lana's appearance in the trailer. She seems to have got her hair straightened out, which is fine I guess, but somehow she also worked herself up to a body type three, which feels very weird. So while the Empire was being crushed, she was busy hitting the gym? I dunno. Valkorion has all these wrinkles on his face! And not just because he's old, the textures are just that much more detailed. You can even see his knuckles in detail! And then you look at that player character with his cartoonishly smooth face, and it just looks extremely odd, like they are not even characters from the same game. That worries me a little, as I can see that kind of thing pulling me out of my immersion while playing. Finally, the big question that was raised by this trailer was that of decisions. It ends with Valkorion telling the knight that he doesn't have to oppose him and that he can join him instead. My first thought on seeing this was actually: "Why are they ending with this? We all know that nobody will be able to join the bad guy, they'll just get players hyped over nothing." But with Bioware emphasising that our choices will make a bigger difference in KotFE, who says that this won't be possible? Werit had an interesting post on this subject, followed by some thoughtful discussion in the comments. The question is: How far could Bioware let the story deviate? Because there needs to be a common thread again at some point, nobody can realistically keep telling a story with constantly multiplying branches. Letting the player choose whether to side with Volkorion or not might very well be doable however. It would indeed have to result in some very different gameplay at least for a while, but that doesn't mean that it can't merge with another story thread again at some point, e.g. if Volkorion betrays you later and therefore becomes your enemy again. I am definitely more intrigued by the upcoming story progression now. Coffee! Yes! Finally someone else! I have to say that the choice to kneel and join forces with Valkorian is interesting, but I don't see a scenario where we say yes and actually join his side. Certainly not on a permanent basis. I do like that it's in there. There was a BioWare blog post by Jesse Sky where he talked about watching the Empire Strikes Back, and wanting to go that route for KotFE. You can certainly see the influence with Valkorian's offer. It's Vader asking Luke to join him. It certainly is intriguing, but if Valkorian tells me that he's my father I'm done, lol. Oh, and like you I have a hard time referring to this expansion as anything other than Knights of the Fallen Empire. I don't see kneeling as a viable option. If you kneel, he'll merely chop off your head. 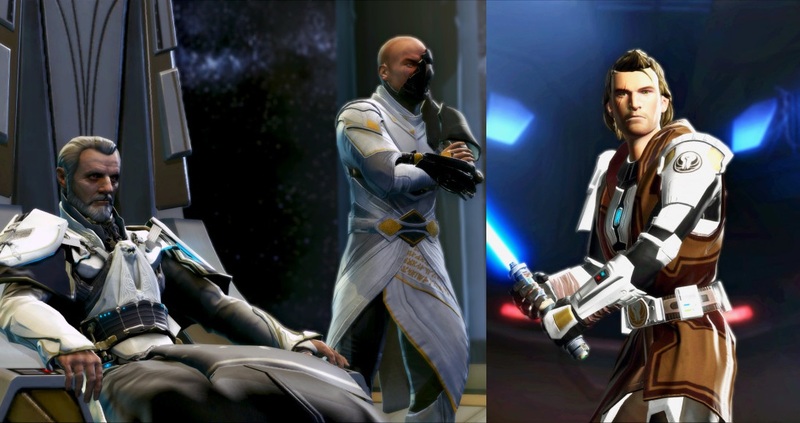 For kneeling, there is a point in the Agent storyline where Darth Jadus commands you to kneel. If you don't kneel, he force chokes you into unconsciousness. So they've already done something similar before, and Valkorian's choice could pan out in a similar fashion.